Homemade Soap Recipe - "Fresh!" Fresh! is a homemade soap recipe scented with lavender, rosemary and eucalyptus essential oils and is perfect for adding some 'get up and go' to your morning routine. A beautiful blue bar coloured with ultramarine blue, hydrated chromium green oxide and white mica. 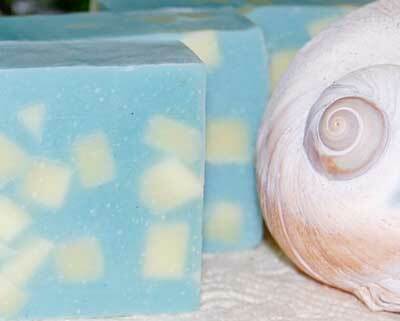 Plain white chunks of soap add visual appeal while making the blue base colour appear to have more 'punch'. Distilled Water - 234 gr. | 8.3 oz. Lye - 91.7 gr. | 3.2 oz. Take note that this recipe only uses 650 grams of base oils. With the addition of the soap chunks, the recipe will make the same amount of soap as my normal recipes. If you do not add the soap chunks, be sure to increase the amount of base oils to fit your mould. Pre-mix the oxides and mica together with a small amount of olive oil and put aside. When the soap has reached a thin trace, add the pre-mixed colourant. Once the soap reaches a medium thick trace, add in the essential oils and keep mixing until a thicker trace is reached. Add the white soap chunks, give it a good stir and pour the soap into your prepared soap mould. Insulate the soap and it should be ready to remove from the mould in 24 to 48 hours.